It is very nice and satisfying to tear open a packet of Lipton onion soup mix, stir it into a tub of sour cream, and call it a day. Served alongside Ruffles chips (because, let’s be real, Ruffles chips are the best), French onion dip aka “California dip” can feed large, hungry crowds in one fell swoop. Plus, it’s freaking delicious. I’ve spent much of my early dinner-party-throwing years trying too hard with pureed soup shooters, salades composées, and hors d’oeuvres that take forever to prepare. But when I look back, sour cream dip is the one thing I still make today in my adult life for my adult friends, in my adult kitchen. It’s what people want. Delicious though French onion dip is, I wanted a dip that was more…me. When I think, What is “me”? (which isn’t hard for an egotist like myself), the flavor notes that come to mind are rice vinegar, sesame oil, and roasted seaweed snack—Korean-style salted, cooked nori. Maybe because they encompass how I like to season my food: with acid (rice vinegar), with salt (roasted seaweed snack), and with nuttiness, or what the Koreans call gosohan mat (sesame oil). Over the years these ingredients have crept their way into most of my recipes, to the point where it’s a running joke here that I’m casually developing a nori column. This is how I crudités. I present to you my Nori Sour Cream Dip. A sour cream dip all the same, but Korean-inflected and with nuance. Instead of Lipton onion soup mix, that deliciously desiccated “maraca-shake of onions rattling in a paper packet,” as Amy Thielen once called it, mine calls for a couple packets of those roasted seaweed snacks that I grew up eating, and that have been in vogue among the Trader Joe’s generation as of late. It’s the secret ingredient in much of my cooking, gives everything a savory note that hits all the pleasure centers of the brain. 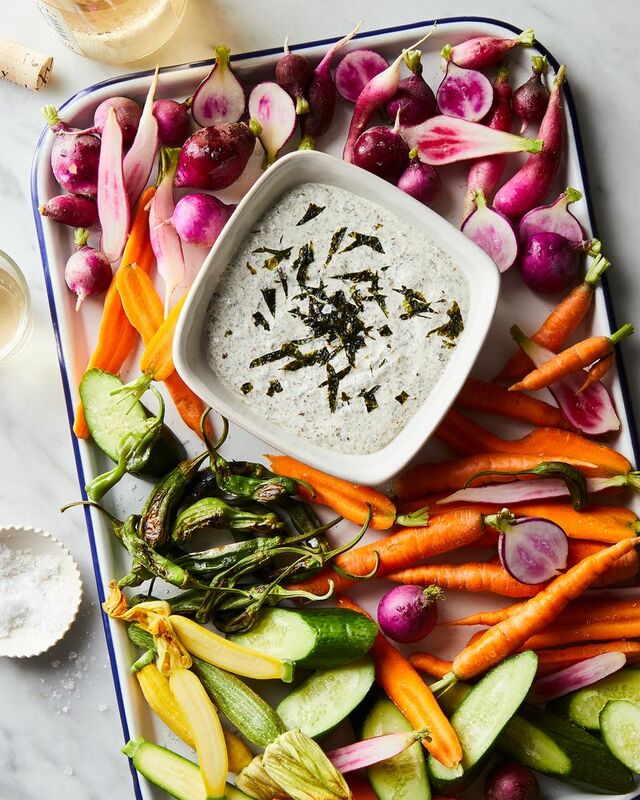 This dip is salty, creamy, and umami-rich, makes you want to eat vegetables (which I don’t do very often). Though it tastes great with bitter, crunchy vegetables like radishes, radicchio, and endive (sweet carrots and cucumbers are very good, as well), more often than not I eat it with Ruffles potato chips, roast chicken, heck, even fried rice. 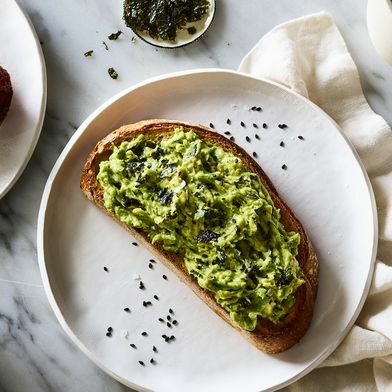 Nori sour cream dip is that versatile, and in its versatility lies its charm as a dip-slash-sauce-slash–dinner party savior. It’s one of those recipes that people always ask me for. Even when I’ve cooked a thousand other more complicated, seemingly delicious things, this five-minute dip is the one they seem to remember most. What’s your favorite sour cream dip? Let us know in the comments below.